Christmas is just around the corner and people from all over the world have been impatiently waiting for this special time of year. This includes ourselves here at Apple Language Courses! However, when thinking about Christmas, people in different countries have different things on their minds. Although celebrating the same event, Christmas traditions around the world can vary quite a lot. What they do have in common is how enjoyable and special this time of year can be. This article will provide you with fascinating facts about Christmas traditions around the world, including festive food and decorations. 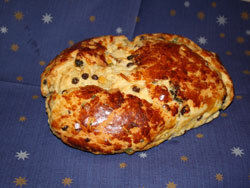 Weihnachtsstollen is a German type of fruit cake which is traditionally eaten during the Christmas season. Everyone in my family looks look forward to this delicious treat each year. 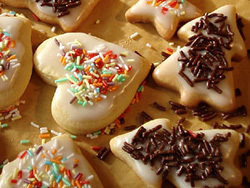 Without Weihnachtsstollen we would definitely miss out on something at Christmas. I would like to share our old family recipe with you. Make sure that you treat yourself with this absolute delight! Have you ever wondered how French people celebrate Christmas? This is how! The 24th December is a normal workday in France. It is only by the evening that the festivities begin. It all starts with the traditional Christmas Midnight Mass (Messe de Minuit), where the entire family goes to church to celebrate the birth of Christ. 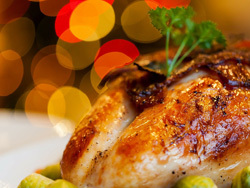 After that, families go back home or to a restaurant to celebrate the Réveillon (Christmas dinner). 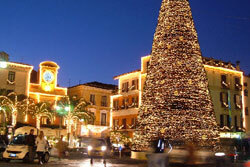 The beautiful Italian coastal town of Sorrento is rooted in the holiday tradition of Christmas. In every square, Christmas lights cover trees and figures around the town. 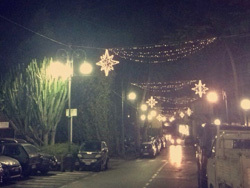 Each street has hanging and glowing decorations, and storefronts are covered in strands of twinkling lights. Garlands abound throughout the city. The palm trees glow and sway in the wind. Stores and street vendors alike start selling Christmas trinkets and gifts. As December approaches, I can’t help but think about one thing and one thing alone: Christmas! 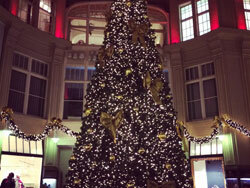 British Christmas traditions are well known to me since I was born and raised in the UK. Finding out what happens during a Russian Christmas was exciting and a little different to what I expected! Now first things first, Russians actually celebrate New Year. 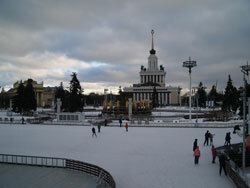 This became the norm during Soviet rule, as the government was atheist and forbade religious celebrations. In a previous blog post you can read everything about German Christmas tradition which vary between families and the part of Germany you are currently staying, living or grew up in. 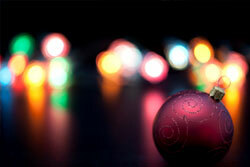 Today I don’t want to talk about the traditions, which of course play a huge role during Christmas time. I’d prefer to talk about Christmas time in general and especially Christmas markets – a huge, undeniable and unforgettable part of Christmas in Germany! The shops are already starting to fill with Christmas gifts and the season of goodwill is fast approaching! 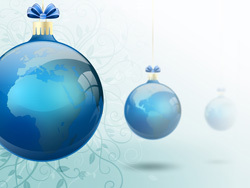 What better present for yourself or a loved one than a Christmas language course? The festive season is a wonderful time to take a language course, particularly if you are staying with a host family, as you really will have the most unique insight into the local culture. Several of our schools offer very special Christmas programmes, which are designed to give you the best experience possible! As we discussed in our earlier post on specific Christmas Language Courses, Christmas and New Year is a really special time to visit a country and immerse yourself in a language course, as this is a time where culture and tradition come to the fore. You will also find people are even more eager to tell you about how they will be celebrating, giving you even more opportunities to flex your linguistic muscles! Some of our schools offer special Christmas courses, as we mentioned. However, many more also remain open over this period. In general, most will close for a couple of public holidays during this time; typically 26th December and 2nd January, although this does vary depending on the location, so please do check this with us before you book.